Team GB: Which athletes have booked their London 2012 places? 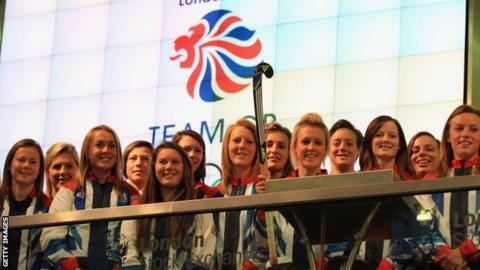 Great Britain's 541-strong team for the 2012 Olympics in London will include 262 women, more than 100 more female competitors than ever before. Team GB's official delegation is Britain's largest for more than a century and the biggest since London hosted the Games for the first time in 1908, when 676 athletes competed for the host nation. The British Olympic Association is the first of the 203 National Olympic Committees to officially enter its team. The youngest Team GB member is 15-year-old artistic gymnast Rebecca Tunney, while 56-year-old dressage rider Richard Davison is the oldest. There is a broad range of experience in the squad, with archer Alison Williamson and eventers Mary King Nick Skelton taking part in their sixth Olympic Games. There are also a number of Olympians targeting further glory, namely Sir Chris Hoy, who has already won four track cycling golds, Ben Ainslie, with sailing gold at three consecutive Games, and swimmer Rebecca Adlington, who claimed two golds in Beijing. There were a number of contentious selections. Sprinter Dwain Chambers, shot putter Carl Myerscough and cyclist David Millar all get the chance to compete in London having previously been banned from Olympic participation for failing drugs tests. But perhaps the most contentious centred on taekwondo, with world number one Aaron Cook omitted in favour of Lutalo Muhammad. Many athletes appealed their non-selection but only a handful were successful, among them 800m runner Gareth Warburton, canoeist Abigail Edmonds and men's beach volleyball pair John Garcia Thompson and Steve Grotowski. Sprinter Richard Kilty and 800m runner Jemma Simpson were among those to lose their appeals. UK Sport, which has invested £300m in Olympic and Paralympic sports and athletes in the past four years, has targeted of a top-four finish in the medals table. Team GB won 47 medals in Beijing but UK Sport wants 48 from at least 12 sports in London. GB chef de mission Andy Hunt said: "For the 542 athletes who have achieved the honour of representing our greatest team, many years of dedication, sacrifice and relentless preparation will culminate in the biggest, most exciting moment of their sporting careers this summer. "Our commitment to these athletes is to be the best prepared, best equipped and best supported delegation in British Olympic history. We are ready to deliver. "It is important at this moment to also acknowledge and recognise the many athletes who have given their all but narrowly missed out on their dream of selection to Team GB. "Their disappointment is a testament to the great strength in depth developed across many Olympic sports in the UK." Below is the list of the 542 athletes who have been selected by the BOA. Six archers will compete in London, including 2004 bronze medallist Alison Williamson at her sixth consecutive Games. The third and final national selection shoot for British archers took place in April at their national headquarters in Lilleshall, with Amy Oliver, Naomi Folkard, Larry Godfrey and Simon Terry sealing their places. The remaining places were given to Williamson and Alan Wills in May. Williamson, 40, will become only the fourth British Olympian to compete in six Games. Alison Williamson,Amy Oliver,Naomi Folkard,Larry Godfrey,Simon Terry and Alan Wills. The selection of the GB squad for London involved numerous sub-plots as the host nation's athletes battled to secure their places at the Olympic Stadium in August. Results from the GB trials on 22-24 June in Birmingham played a large part in selection, but they did not give the complete picture as athletes needed to hit a system of 'A' and 'B' standards set by UK Athletics. There was also the long-running case of Dwain Chambers, who was finally allowed to compete after the British Olympic Association policy of lifetime bans for drug cheats was overturned. Previously selected for marathon:Scott Overall,Dave Webb, and Lee Merrien were all originally selected to compete at London 2012, but Webb was forced to withdraw from the Games in July with a stress fracture. No replacement athlete was called up. As the host nation Great Britain was entitled to enter two players, with others able to qualify on merit according to the rankings. The biggest internal selection battle was in the mixed doubles, traditionally the source of GB success on the Olympic badminton stage. With victory over team-mates and rivals Nathan Robertson and Jenny Wallwork at the European Championships, Chris Adcock and Imogen Bankier did enough to secure nomination to Team GB. They will be joined in London by England's Rajiv Ouseph and Scotland's Susan Egelstaff in the singles. In March 2011, world governing body Fiba revealed that Great Britain would be allowed to take up host-nation places for men's and women's basketball at the Games, and the draw took place in April. Luol Deng, born in Sudan (now South Sudan) and currently a leading light of the NBA with the Chicago Bulls, will play a key role as the GB men play Olympic basketball for the first time since 1948. However, he is the only current NBA star in the final 12-man squad after Ben Gordon failed to report to the recent training camp in Houston, and Byron Mullens dropped out of the provisional squad due to an injured toe. Twelve players have been named in the first Team GB women's basketball squad to compete at an Olympic Games. Great Britain is automatically granted one men's and one women's team as the host nation, but each country can enter two pairs, so there is the opportunity for eight Britons in total to qualify. British number one duo Zara Dampney and Shauna Mullin have been allocated GB's host nation spot for the women's event. It is the first time a British pair have featured in an Olympic tournament since the event made its debut at the 1996 Games in Atlanta. John Garcia-Thompson and Steven Grotowski got the nod for the men's place ahead of Jody Gooding and Gregg Weaver, and Robin Miedzybrodzki and Tom Lord. While the women can prepare for the Games with the aid of money from UK Sport, the three men's teams had their public funding cut in 2010. The first five members of Britain's boxing team for 2012 were named in December following a successful showing at the World Championships in Azerbaijan. Anthony Ogogo and Josh Taylor then earned places on the GB team thanks to their performances in a European qualifying event in April, and the final squad of 10 boxers - Britain's largest ever - was named on 11 June. For the first time ever, the 2012 Games will feature women's boxing, with three classes on show - flyweight (48-51kg), lightweight (56-60kg) and middleweight (69-75kg). Middleweight Savannah Marshall, lightweight Natasha Jonas and flyweight Nicola Adams secured their places with their performances at May's World Championships in China, with Marshall doing it in style by winning the world title. Canoe slalom held its GB Olympic selection trials in mid-April, from which five paddlers - the maximum number possible - made it through and were later confirmed on Team GB. David Florence and Richard Hounslow are the leading hopes for gold in London. In canoe sprint, the biggest selection dilemma came in the K1 1,000m discipline, in which Tim Brabants is the defending Olympic champion. Brabants faced challenger Paul Wycherley for the one available spot over that distance at the 2012 Olympics and it came down to a decider before the 35-year-old won 2-1. Ed McKeever has high hopes of gold after impressing on the World Cup circuit in 2012. British cyclists are hoping to match the 14 medals and eight golds they won in Beijing. Sir Chris Hoy, Victoria Pendleton, Mark Cavendish and Shanaze Reade are among the leading gold medal hopes, while the inclusion of David Millar in the shortlist for the road squad has caused controversy. The 35-year-old Scot was banned for two years in 2004 for taking performance-enhancing drugs. Tom Daley is the star name of the sport in Britain and the 18-year-old will go to his second Olympic Games. He and Peter Waterfield looked in fine form behind the Chinese in the World Series of spring 2012. Monique Gladding has been selected after recovering from a life-threatening injury when she fractured her skull on the platform while competing in Russia last year. Zara Phillips, the Queen's granddaughter, will compete at her first Olympic Games after being named in a team of five for eventing, alongside William Fox-Pitt, Mary King, Tina Cook and Nicola Wilson. Cook, Fox-Pitt and King were part of the eventing team which claimed bronze at the 2008 Olympics in Beijing. Piggy French was initially selected but had to withdraw on 2 July because of an injury to her horse, DHI Topper W.
As a powerhouse of global equestrian sport, Britain will also field full Olympic teams in dressage and show jumping. There has been intense competition within Britain to reach the team in each of these events, especially in dressage and eventing, where Britons are routinely gold medallists at world level. Dressage sees Carl Hester and Laura Bechtolsheimer leading the way, while Fox-Pitt has established himself as one of GB's biggest names in eventing. In show jumping, Scotland's Scott Brash will make his Olympic debut after being named along with Nick Skelton, 54, who goes to his sixth Olympics, Ben Maher and former European champion Peter Charles. Tim Stockdale failed in his bid to make a brave bid to come back from a broken neck in time to compete at the Olympics. Britain's fencers will compete in all three disciplines of epee, foil and sabre in London. There are eight host-nation places with two others qualifying on merit - Richard Kruse, who is set for his third Olympic Games and will compete in the men's foil event, and Natalia Sheppard in women's foil. Seven fencers were confirmed in Team GB on 1 June, with three additional athletes revealed on 12 June. alongside two reserves. Great Britain's men will return to the Olympic Games for the first time since 1960, while the women make their debut in the competition. Thirteen English players and five from Wales were named in the much-anticipated men's squad, which was the subject of some controversy as not all the home nations wished their players to be involved. There was also the long-running saga of whether David Beckham would get called up as one of three over-age players, but in the end Stuart Pearce elected to leave out the former England captain. The women's squad was a more straightforward affair, with star striker Kelly Smith named in the Team GB squad after recovering from injury. The only non-English players selected in the squad of 18 were Scots Ifeoma Dieke and Kim Little. Team GB men's football squad: Jack Butland,Jason Steele,Ryan Bertrand,Steven Caulker,Craig Dawson,Micah Richards,Danny Rose,Neil Taylor,James Tomkins,Joe Allen,Tom Cleverley,Jack Cork,Ryan Giggs,Aaron Ramsey,Scott Sinclair,Craig Bellamy,Marvin Sordell,Daniel Sturridge. Team GB women's football squad: Eniola Aluko,Anita Asante,Karen Bardsley,Sophie Bradley,Rachel Brown,Karen Carney,Ifeoma Dieke,Stephanie Houghton,Kim Little,Claire Rafferty,Alex Scott,Jill Scott,Kelly Smith,Casey Stoney,Fara Williams,Rachel Williams,Ellen White,Rachel Yankey. Britain will send two full artistic gymnastics teams to the Olympic Games - the women qualified at last year's World Championships while the men, who failed at that first opportunity, came through at the second time of asking in January's Olympic test event. There will also be British representation in the rhythmic gymnastics team event, following a protracted appeals process which saw a verdict in favour of the British gymnasts, who had initially been turned down for selection by their own governing body. Frankie Jones takes up the individual rhythmic gymnastics place. Kat Driscoll earned Britain its only trampoline place at the Games by qualifying at the 2011 World Championships in Birmingham. In the artistic gymnastics squad, Beth Tweddle is still chasing an Olympic medal at her final Games and is joined in the women's team by Rebecca Tunney, the youngest member of Team GB at 15. Dan Keatings, the 2009 world silver medallist, misses out in the men's team, leaving 2010 world bronze medallist Dan Purvis and Beijing 2008 pommel horse bronze medallist Louis Smith as the leading figures. Britain will compete in handball for the first time in London and the sport's national programme only came into being in 2006, specifically to create teams for London 2012. The women in particular have made encouraging process, beating African champions Angola at the Olympic test event in November, and a squad of 14 women has been named. They will face Montenegro, Russia, Croatia, Brazil and Angola in the group stage. "I am looking forward to showing the British public how fantastic handball is and how hard we have worked and how competitive we can be with the best handball teams in the world," said captain Lynn McCafferty. The British men have recorded only two competitive international victories to date, and their squad announcement followed a fortnight after the women's. Britain's hockey teams are both sufficiently strong - each ranked fourth in the world - that they would have been expected to qualify for London 2012 even without the luxury of automatic places as the hosts. The women's squad of 16 was announced in May, with the men named a month later in June. Among those not make it were brothers Richard and Simon Mantell, as well as Richard Alexander. "Simon Mantell is not fit to be selected," said coach Jason Lee, "so it is not even a discussion point as to whether he would make the squad. "There are certainly players in isolation who would consider themselves to be great players - but it was actually about how they combined together, which is what we were trying to work towards for the final 16." There are 14 medal events across seven weight categories for both men and women, and British judokas received one place in each by virtue of hosting the Olympic tournament. The remaining places were based almost entirely on the world ranking list prepared by governing body the IJF on 1 May 2012. Men's -73kg - Daniel WilliamsWhich athletes have made Team GB?Which athletes have made Team GB?Which athletes have made Team GB? Men's -81kg - Euan BurtonWhich athletes have made Team GB? Great Britain had one place guaranteed in each of the two medal events but managed to qualify a full quota of two men and two women. World champion Mhairi Spence and bronze medallist Samantha Murray make a very strong women's line-up, while world number five Nick Woodbridge and European silver medallist Sam Weale will have high hopes in the men's event. British modern pentathletes have won four medals since the women's event was added to the Olympic programme in 2000 at Sydney. Britain will be represented in 13 of the 14 Olympic classes and is likely to challenge strongly across the board, with expectations of surpassing the two golds - and six medals in total - won in Beijing. GB missed out on qualifying boats in every Olympic class for the first time when they failed to secure a women's single scull place at the last qualifying regatta in Lucerne in May. However, the likes of Katherine Grainger and Anna Watkins in the men's four, Zac Purchase and Mark Hunter in the men's lightweight double scull, and the ever-powerful British men's four should challenge strongly for gold. Great Britain will have high hopes of medals throughout the 10 Olympic classes on home waters in Weymouth. Seven of the 10 boats had their line-ups confirmed as early as September, with the remaining places in the men's 49er and the women's Laser Radial confirmed in May. Ben Ainslie will be the centre of attention in Weymouth as he goes for a fourth straight gold medal, although his preparations took a blow at the World Championships in December when he was disqualfied from two races and failed to make the final after an altercation with a camera boat. Britain's strength in depth was demonstrated when, in Ainslie's absence, compatriots Giles Scott and Ed Wright took gold and bronze. However, Ainslie had been leading before his disqualification and will remain strongly fancied to strike gold again. World number one Peter Wilson and former Olympic champion Richard Faulds are among 11 shooters named in the Team GB squad for London 2012. British shooters will compete across the shotgun, pistol and rifle disciplines at the Royal Artillery Barracks in Woolwich. Keri-Anne Payne became the first British athlete to qualify for the 2012 Games when she won the World Championships in China, and having taken silver when the 10km event made its Olympic debut four years ago, she is well placed to go one better. Payne's name was officially added to the Team GB list along with 37 other swimmers following the British trials at the Olympic venue in March. Double Olympic champion Rebecca Adlington confirmed she will be defending her 400m and 800m freestyle titles with victories in both events, saying: "Four years it has taken to get to this point and you can't imagine how good it feels to get here." The remaining swimming places were decided at a second trials in Sheffield in June, with 30-year-old David Carry among those to book his place. "I've never been so emotional after a swim before," he said. "Knowing that I had this one last chance to stand up and perform, it was a really special moment to win it." Nine athletes have been selected for the British team in London for the one event in which only women take part. They will compete for medals in two disciplines - the duet and the team. The original Great Britain of squad of 13, based in Aldershot, finished eighth in the Olympic test event in April, and the Olympic squad announcement was made the following month. Jenna Randall and Olivia Allison will form the duet partnership, having risen to eighth in the world rankings last year, and the target for both the duet and team events is a top-six finish in London. Great Britain has host-nation entry into the two team events, meaning three British men and three women will compete in London, with one player from each team getting places in the singles events. With two players per nation allowed in each singles event, the opportunity had been there for other Britons to qualify, but they failed to do so at the European qualifying event in April. There are eight medals on offer in taekwondo but nations can only enter a maximum of two men and two women, so they must choose which disciplines to target. Britain will be represented in the men's -68kg and -80kg categories, and the women's -67kg and -57kg. Sarah Stevenson (-67kg), Jade Jones (-57gk) and Martin Stamper (-68kg) were named in Team GB on 1 June, but the remaining place caused the British Olympic Association (BOA) to take the historic step of vetoing GB Taekwondo's nomination. The governing body chose Lutalo Muhammad ahead of world number one Aaron Cook in the -80kg category, but the BOA's decision means GB Taekwondo had to look again at their original nomination. However, Muhammad remained the choice of GB Taekwondo and the BOA accepted the nomination at the second time of asking. Andy Murray was the only tennis player to be certain of his Olympic place as the world number four, but a total of eight home players will be on view when the Olympics take over Wimbledon for nine days. With 64 players in the each of the men's and women's singles events, 16 pairs in the men's and women's doubles and 12 in the mixed doubles, the pressure was on to achieve the necessary ranking to make the cut. A maximum of six players per nation are allowed in the singles events, and it was expected that a ranking of around 70 would be necessary to get in when the cut was made on 11 June. The likes of Elena Baltacha, Anne Keothavong, Heather Watson and Laura Robson failed to reach that target, but each was given one of the places left to the discretion of the International Tennis Federation. Balatcha and Keothavong will play singles, while youngsters Robson and Watson team up in the doubles. On the men's side, the steadily improving duo of Colin Fleming and Ross Hutchins made it in on their ranking, and will be joined by brothers Andy and Jamie Murray. The selections for the mixed doubles event will be made at the start of the Olympic tennis tournament from the players on site, and it will be intriguing to see which pairing will emerge from the British squad. Britain boasts the current world champions in Alistair Brownlee and Helen Jenkins, along with Jonny Brownlee - runner-up behind his brother last year. The three are such strong medal hopes that two of the other three places in the squad have gone to domestiques, with Stuart Hayes and Lucy Hall charged solely with helping Britain's leading trio towards the top of the podium. Vicky Holland completes the squad after finishing fifth and seventh at the World Cup races in San Diego and Madrid this year. Great Britain has host nation places in both the men's and women's tournaments, which each involve 12 teams split into two groups of six. Following funding cuts in 2010, the GB centralised programme in Sheffield was closed down and players headed to Europe to play club volleyball, but they will return to Sheffield in May for final preparations before the Games. The host-nation places will see Great Britain return to the Olympic water polo competition for the first time since 1956, and a total of 26 athletes - 13 male and 13 female - were named in the squad in June. Twelve teams will compete in the men's tournament and eight teams in the women's tournament. In January, Britain's women reached European Championships for the first time in 15 years. A recent funding boost will allow the men's squad to bring a world-class nation into their holding camp for match practice, and the women to add a competition to their preparation. There are 15 medal events in London across eight weight categories for men and seven for women. Great Britain, as the host country, has been allocated three men's and two women's places. Commonwealth bronze medallist Zoe Smith, 18, will make her Olympic debut along with 36-year-old Welsh lifter Natasha Perdue. Scotland's Commonwealth silver medallist Peter Kirkbride is the highest-profile lifter in the three-strong men's squad, which also includes Welshman Gareth Evans and English 20-year-old Jack Oliver. There are two forms of wrestling - Greco-Roman and freestyle - with 18 medals on offer between them. In May, Great Britain's original allocation of three host-nation places was reduced to just one spot in the women's freestyle -55kg category by the BOA after they declared British Wrestling had failed to achieve agreed performance targets.